That’s what Queen does for people of my age: ignites happy memories of our youth. 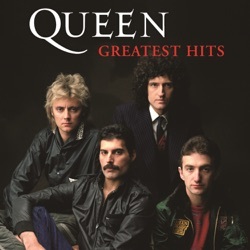 The treacly Classic Queen compilation released this spring omitted many of the Queen’s best tracks. The Greatest Hits hard-rocking set — heavy on the group’s ’70s prime — is where they wound up. This record gathers their biggest US/UK hits, 1973-1981, including the collaboration with David Bowie, "Under Pressure," which was not on the reissue from EMI. The track list pretty much selects itself, and all the songs will be entirely familiar to those who were around during their most successful years. One of the most successful albums of all time, having shifted 25 million copies and covers the first stage of their career, spanning Seven Seas of Rye (1974) to Flash (1980). Amazing! My favorite Queen songs are here! However, I would have wished that "Under Pressure" was included as well. We all like Queen so shut up Yes, I think everyone here can agree that Queen is a great band, but nobody here cares that you were born in the wrong generation. Nobody wants to hear about your "special" taste in music. "Am I the only one who listens to Queen anymore?" No! You're not! That is the reason we are all here right now. Besides, if you were born in the 80s you wouldn't have your precious iPhones and computers and texting. Overall great album even though Flash is in here for some reason. For everyone asking I love this album so much! For everyone asking about "the show must go on" and "under pressure" and those songs you can buy them on greatest hits 1, 2, and 3. Or if you already bought this album buy the songs you want individually on there!